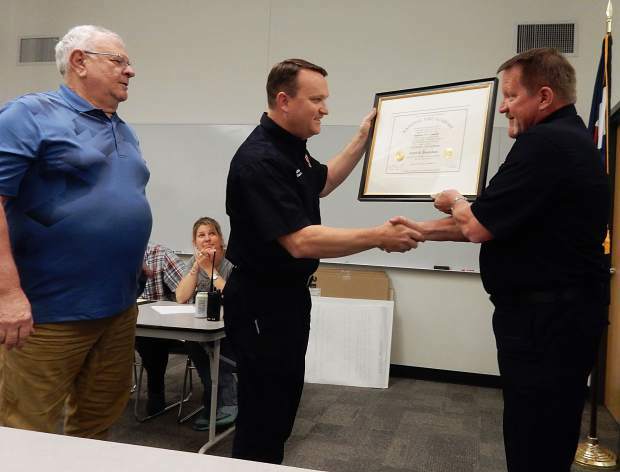 Basalt Deputy Fire Chief Pete Bradshaw (center) receives a certificate as Executive Fire Officer from Basalt Fire Chief Scott Thompson as fire board member Leroy Duroux looks on. Bradshaw earned the designation after intensive studies at the National Fire Academy. Basalt Deputy Fire Chief Pete Bradshaw earned his executive fire officer designation this spring, becoming only the third firefighter in the valley to achieve the accomplishment. 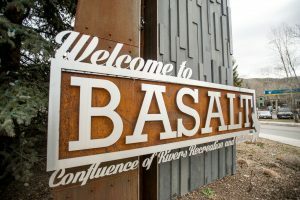 In presenting the certificate from the National Fire Academy to Bradshaw at a recent meeting of the Basalt volunteer firefighters, Basalt Fire Chief Scott Thompson said the designation is like earning a master’s degree. Bradshaw attended four two-week classes at the National Fire Academy Campus at the National Emergency Training Center in Emmitsburg, Maryland, and spent “countless hours in the books,” as well. At the end of each session, he had to complete an applied research paper related to the course topic. Bradshaw said he applied for the program to maintain his continuing education in the fire service, renew his enthusiasm for the profession, and network with fire service professionals from across the country. He credited Thompson for his willingness to let him take time away for the studies and he credited his wife, Laura, and their two kids for their support while he was gone and studying. 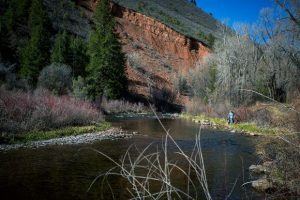 Bradshaw said the number of EFOs in the country who are actively engaged in firefighting is estimated in the thousands. 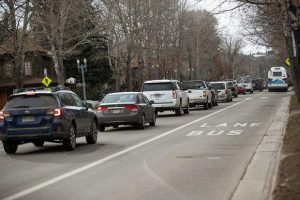 In the Roaring Fork Valley, that includes Snowmass-Wildcat Deputy Chief Kevin Issel and Glenwood Springs Fire Department Battalion Chief Doug Gerrald.